The Open Water Vacation Giveaway is provided courtesy of Open Water Source. Winners will be randomly selected from among those who register in advance for the 2012 Global Open Water Swimming Conference in Long Beach, California on the RMS Queen Mary between September 21st - 23rd. Four vacation giveaways will be given away among those who register for the conference. Winners will be announced on September 22nd at the Conference. 1. Bahamas Vacation for Two - 4 days & 3 nights for 2 adults on a round-trip cruise from Fort Lauderdale, Florida aboard Discovery or Sea Escape to the Grand Bahamas. All meals and entertainment included on the ship. Once you arrive on the island, enjoy a stay at the Island Palms hotel. Then get back on the return cruise to Florida. Estimated taxes of approximately US$152 per person must be paid. 2. 3. 1,000 Fantastic Locations - choose your 3-day & 2-night hotel stay for 2 adults at any of over 1,000 Marriott Hotels or Days Inns in the U.S. and Canada Estimated taxes are between US$8—$13 per night. Enjoy Cancun in Style - 5 day & 4 nights at a wonderful Cancun resort. Estimated taxes of approximately $180 per couple. 4. Central American All-Inclusive - 3 days & 2 nights all-inclusive stay at a fabulous resort. All meals, drinks, and activities are included. Estimated taxes approximately US$60 per person. Each Vacation Package is for at least 2 adults and is upgradeable. Participants must be over 21 to redeem voucher. Winners need to pay taxes and processing fees (noted above). Transportation to and from vacation destination not provided. Some of the speakers and guests at the 2012 Global Open Water Swimming Conference include Diana Nyad (USA), Craig Dietz (USA), Benoit Lecomte (France/USA), Colin Hill (Great Britain), Ricardo Ratto (Brazil), Shelley Taylor-Smith (Australia), Dr. Khwaja Aziz (Bangladesh), Lewis Pugh (South Africa), Ned Denison (Ireland), Dr. Marcy MacDonald (USA), Harry Huffaker (USA), Janez Maroevic (Croatia), Marcos Díaz (Dominican Republic), Stephen Coulter (Australia), John Mix (USA), Steven Munatones (USA), Pilar Geijo (Argentina), Jamie Patrick (USA), Lt. Colonel Nejib Belhedi (Tunisia), Wayne Riddin (South Africa), Janel Jorgensen McArdle (USA), Forrest Nelson (USA), Suzanne Heim-Bowen (USA), Mark Perry (Great Britain), Martin Strel (Slovenia), Greta Andersen (USA) and Erik van Loon (Netherlands). The Conference includes the World Open Water Swimming Awards and the International Marathon Swimming Hall of Fame Induction Ceremony & Dinner where the luminaries of the sport will be recognized and honored. 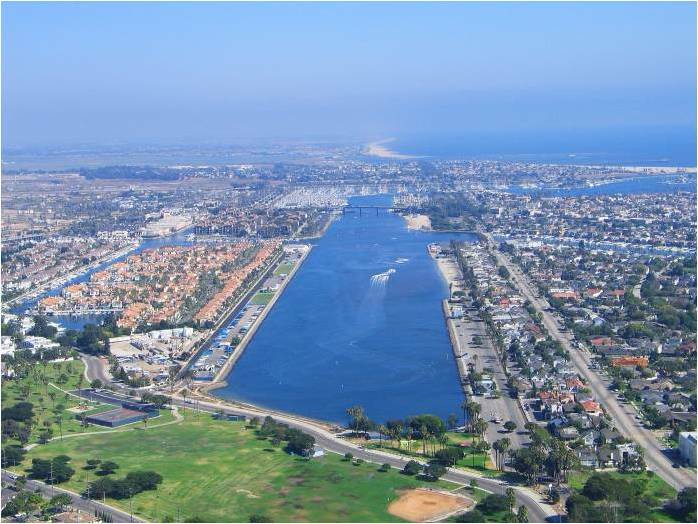 On the last day of the Conference, participants can swim in the new Swim Across America Long Beach event where 100m, 800m, 1.5 km, 5 km and 10 km swims will be held in the 1932 Los Angeles Olympic Games rowing course. The buoys and course will replicate the exact course as used in the 2012 London Olympics - giving participants the opportunity to swim the same course as the Olympians. The new 5-swim charity benefits the Memorial Medical Center Foundation that supports the Todd Cancer Institute in Long Beach, California. 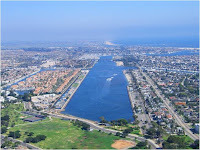 You can register for the 2012 Global Open Water Swimming Conference here and the Swim Across America Long Beach here. It will be a weekend of camaraderie, competition, conversation and company of open water swimmers of all ages, abilities, cultures and backgrounds. Don't miss it. Aerial photo of Marine Stadium by Bob Mcguglin.